How did scientists know that Voyager entered interstellar space? An increase in the density of charged particles was the key piece of evidence. Our sun sits in a bubble, called the heliosphere, carved out by wind emitted from the hot sun. Beyond this bubble, within which all the planets orbit, is interstellar space -- the region filled with plasma and neutral gas between the stars. In this local region of interstellar space, the gas is warm and filled with a mixture of charged particles and neutral hydrogen that are much more dense than the diluted solar wind inside the bubble. 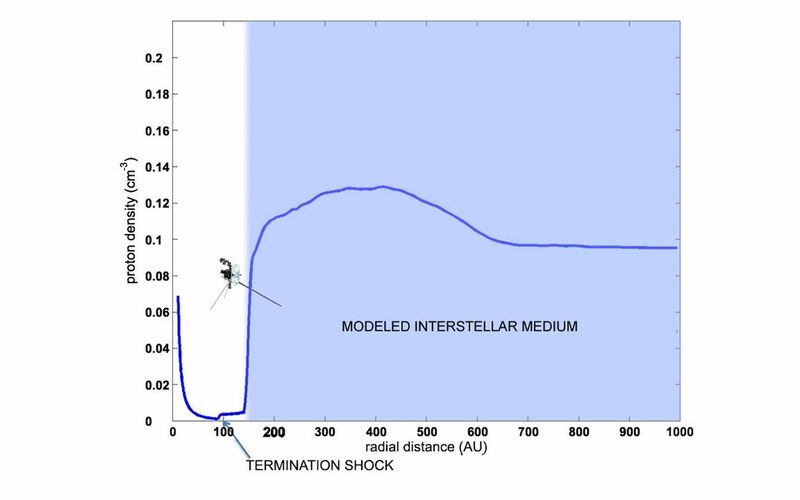 The blue line is a theoretical model showing how the density of particles decreases within the heliosphere as the distance from the sun increases, followed by a comparatively small increase in particle density, which was seen when Voyager 1 and 2 crossed the heliospheric termination shock. 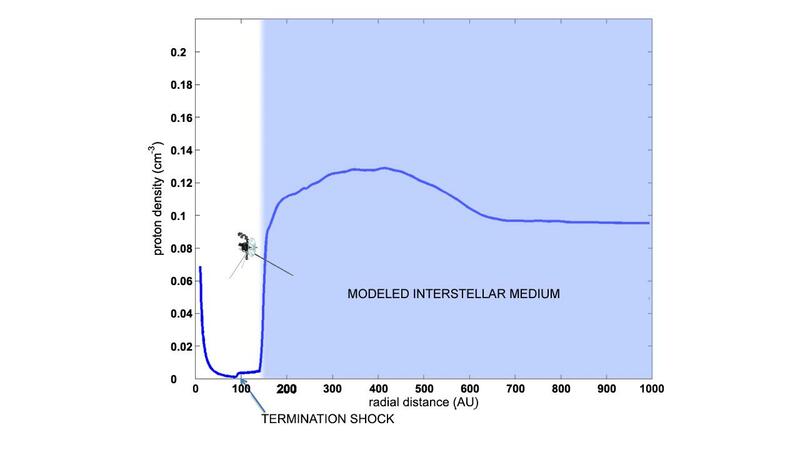 An enormous jump in the plasma density occurs at the transition from the heliosphere to the interstellar medium. 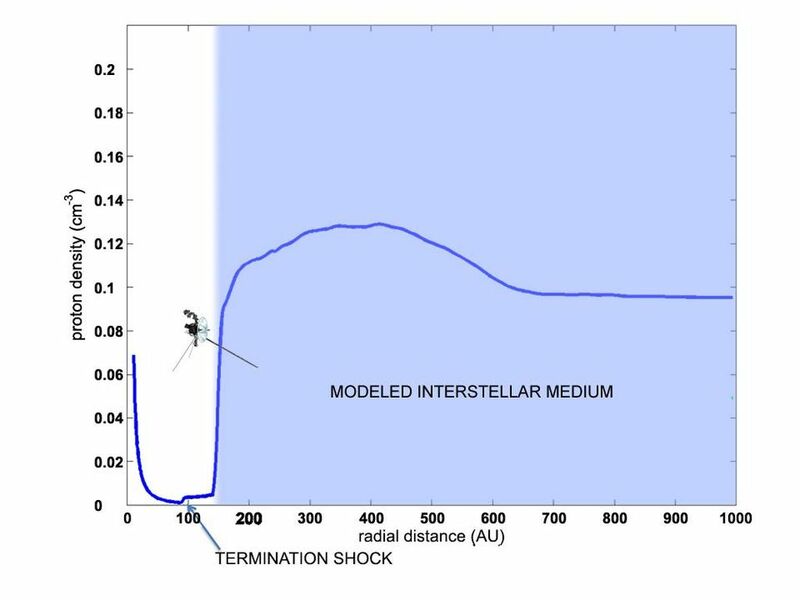 This graphic of Voyager 1 shows its location when it crossed into interstellar space, at 120 astronomical units from the sun, where it measured a proton density of 0.08 cm-3 (an astronomical unit is the distance between Earth and the sun). 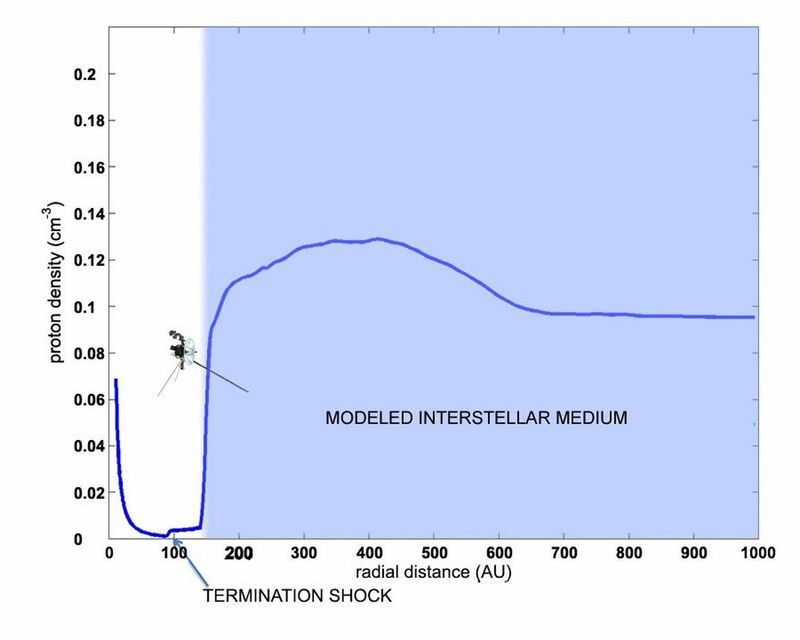 This point lies slightly to the left of the theoretical model, but the density is so high that it cannot possibly be explained unless Voyager 1 is now in interstellar space. The Voyager spacecraft were built and continue to be operated by NASA's Jet Propulsion Laboratory, in Pasadena, Calif. Caltech manages JPL for NASA. The Voyager missions are a part of NASA's Heliophysics System Observatory, sponsored by the Heliophysics Division of the Science Mission Directorate at NASA Headquarters in Washington. For more information about Voyager, visit http://www.nasa.gov/voyager and http://voyager.jpl.nasa.gov. NASAs Solar Dynamics Observatory shows a long lunar transit on Mar. 6, 2019. NASAs Solar Dynamics Observatory shows that the Sun has gone an entire month without any sunspots (Feb. 1-18, 2019). NASAs Solar Dynamics Observatory is in another eclipse season as of Feb. 6, 2019. This image shows the Earth briefly blocking SDOs view of the Sun.